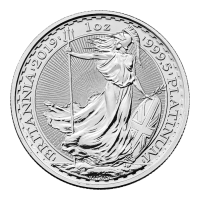 Order your 1 oz 2019 Britannia platinum coin from our online shop today to experience the Internet’s lowest price. As a time honoured symbol of sovereignty and a personification of the land of Britain, Britannia has graced the coinage of every monarch since 1672. The coin's reverse features Philip Nathan's majestic Britannia design; she is shown in dazzling detail, donning her Corinthian helmet and holding her Union Jack shield and trident, keeping watch over the wind swept British Isles. Britannia is set against a dazzling field of micro engraved, star burst and dotted texturing and encapsulated in a border bearing details of name, year of origin, metal content, weight and purity. The obverse is equally striking, bearing a meticulous portrait of Elizabeth II, shown wearing her State Diadem and also set on a micro engraved field of light refracting dot texturing. Also on the obverse, Elizabeth II's regal title, as well as the coin’s denominational value. Over the centuries, Britannia has become a trusty symbol of British Minting and, as such, Britannia coins represent a sound and popular investment. Celebrate the spirit of Britain and enrich your portfolio with a 1 oz 2019 Britannia platinum coin today. Obverse Effigy of Queen Elizabeth II and the words "Elizabeth II 100 Pounds 2019"
Effigy of Queen Elizabeth II and the words "Elizabeth II 100 Pounds 2019"
1 oz 2019 Britannia Platinum Coin Order your 1 oz 2019 Britannia platinum coin from our online shop today to experience the Internet’s lowest price. As a time honoured symbol of sovereignty and a personification of the land of Britain, Britannia has graced the coinage of every monarch since 1672. The coin's reverse features Philip Nathan's majestic Britannia design; she is shown in dazzling detail, donning her Corinthian helmet and holding her Union Jack shield and trident, keeping watch over the wind swept British Isles. Britannia is set against a dazzling field of micro engraved, star burst and dotted texturing and encapsulated in a border bearing details of name, year of origin, metal content, weight and purity. The obverse is equally striking, bearing a meticulous portrait of Elizabeth II, shown wearing her State Diadem and also set on a micro engraved field of light refracting dot texturing. Also on the obverse, Elizabeth II's regal title, as well as the coin’s denominational value. Over the centuries, Britannia has become a trusty symbol of British Minting and, as such, Britannia coins represent a sound and popular investment. Celebrate the spirit of Britain and enrich your portfolio with a 1 oz 2019 Britannia platinum coin today.